Chandos Records’ Spanish Music series (La Música de España) with the BBC Philharmonic and its Chief Conductor Juanjo Mena, a specialist in the repertoire, now reaches the music of Isaac Albéniz, one of the greatest Spanish composers of any era. Highly colourful and subtly contrasted, the Suite española is perhaps the most interesting early anticipation of the great piano collection Iberia, composed about twenty years later, in which, as Debussy remarked, Albéniz ‘put the best of himself’. 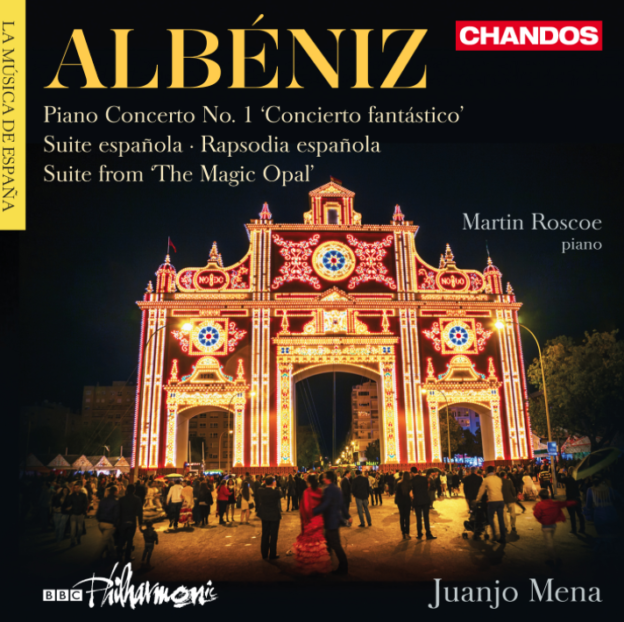 Brilliantly successful though he was as a pianist and composer of piano music, Albéniz also composed operas, having his first success with The Magic Opal, in London, three orchestral movements from which feature here. The soloist in the Concierto fantástico is the British pianist Martin Roscoe, already highly praised for his many past recordings for Chandos, on which he features with artists such as Tasmin Little and Jennifer Pike. Written at the same time as the Piano Concerto yet very different in style, Rapsodia española positively celebrates the Spanish idiom – all the more vividly in the orchestration by George Enescu, chosen for this recording. The piano soloist, again, is Martin Roscoe. “The BBC Philharmonic under Juanjo Mena, finely recorded, play with a suitably heated, open-hearted commitment”. “Martin Roscoe’s performances are of exceptional skill and affection”.